Snook Fishing in Quepos – An incredible experience! Are you ready for the fun and thrilling challenge of Snook fishing in Quepos? If so, at Quepos Costa Rica Fishing we have the ideal solution for you with our incredible fishing excursions. 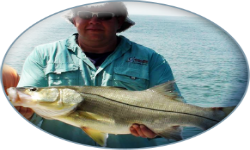 Snook fishing is entertaining and challenging and we are confident you won’t find a fishing trip as exceptional as ours, nor will you find prices as low as we offer. Prepare to be amazed! There are many types of Snook for you to try and hook whilst enjoying one of our popular fishing excursions. They come in an abundance of colors. This includes everything from green and gold, to black and brown, and so much more. Nevertheless, you should easily be able to identify a Snook because they have a distinct black lateral line along their side. They also boast a big lower jaw and two distinct dorsal fins. Generally you can expect to hook a Snook weighing between 20 and 30 lbs. However, Snook fishing Costa Rica situated has generated a lot of attention because the world record for the biggest Snook was found in Costa Rican waters. This comes in at a massive 53 lbs. 10 ounces. Do you think you could beat this? Well, there is only one way to find out! This won’t be an easy challenge. One of the reasons why Snook fishing is so popular is because you experience a thrilling and fierce battle. Snook are well known for their extreme strength and when you are trying to hook one they have a tendency to do a few violent headshakes. This is a fight you don’t want to miss out on. So, how can you expect to catch this strong and tricky type of fish? There are many different baits you can choose from. This includes everything from live pilchards to live shrimp. However, you need not worry about any of this. Our experienced crew members will provide all of the information you need. They will make certain you have the right tackle and bait and that you are aware of the best techniques for catching Snook. One of the best things about choosing Quepos Costa Rica Fishing for your Snook fishing excursion is that our prices are unbeatable. We don’t charge over the odds here. We love Quepos and we love fishing and this is a passion we want to share with as many people as possible. So, why not give it a try? Experienced and novice anglers alike seem to fall in love with Snook fishing in Quepos.